In my recent book “ Gods and Robots ,” I explain that many ancient societies imagined and constructed automatons. Chinese chronicles tell of emperors fooled by realistic androids and describe artificial servants crafted in the second century by the female inventor Huang Yueying . Techno-marvels, such as flying war chariots and animated beings, also appear in Hindu epics. One of the most intriguing stories from India tells how robots once guarded Buddha’s relics . As fanciful as it might sound to modern ears, this tale has a strong basis in links between ancient Greece and ancient India. The story is set in the time of kings Ajatasatru and Asoka. Ajatasatru, who reigned from 492 to 460 BC, was recognized for commissioning new military inventions, such as powerful catapults and a mechanized war chariot with whirling blades. When Buddha died, Ajatasatru was entrusted with defending his precious remains. The king hid them in an underground chamber near his capital, Pataliputta (now Patna) in northeastern India. Traditionally, statues of giant warriors stood on guard near treasures. But in the legend, Ajatasatru’s guards were extraordinary: They were robots. In India, automatons or mechanical beings that could move on their own were called “ bhuta vahana yanta ,” or “spirit movement machines” in Pali and Sanskrit. According to the story, it was foretold that Ajatasatru’s robots would remain on duty until a future king would distribute Buddha’s relics throughout the realm. Hindu and Buddhist texts describe the automaton warriors whirling like the wind, slashing intruders with swords, recalling Ajatasatru’s war chariots with spinning blades. In some versions the robots are driven by a water wheel or made by Visvakarman, the Hindu engineer god. But the most striking version came by a tangled route to the “ Lokapannatti” of Burma – Pali translations of older, lost Sanskrit texts, only known from Chinese translations, each drawing on earlier oral traditions. 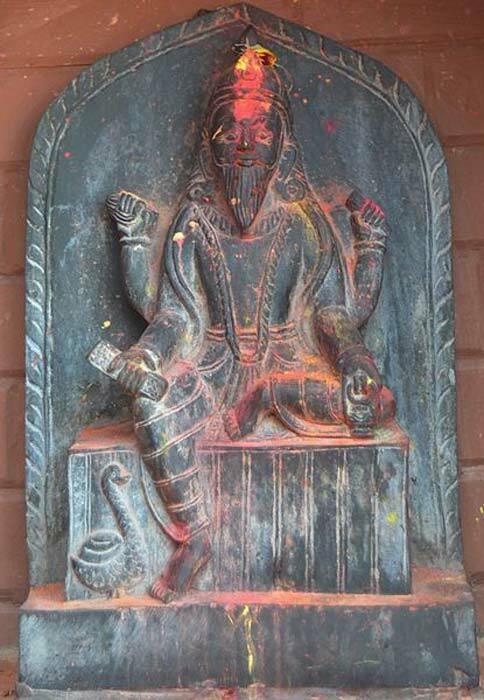 Two centuries after Ajatasatru, Asoka ruled the powerful Mauryan Empire in Pataliputta, 273-232 BC. Asoka constructed many stupas to enshrine Buddha’s relics across his vast kingdom. According to the legend, Asoka had heard the legend of the hidden relics and searched until he discovered the underground chamber guarded by the fierce android warriors. Violent battles raged between Asoka and the robots . But I think the story could be much older. The historical setting points to technological exchange between Mauryan and Hellenistic cultures. Contact between India and Greece began in the fifth century B.C., a time when Ajatasatru’s engineers created novel war machines. 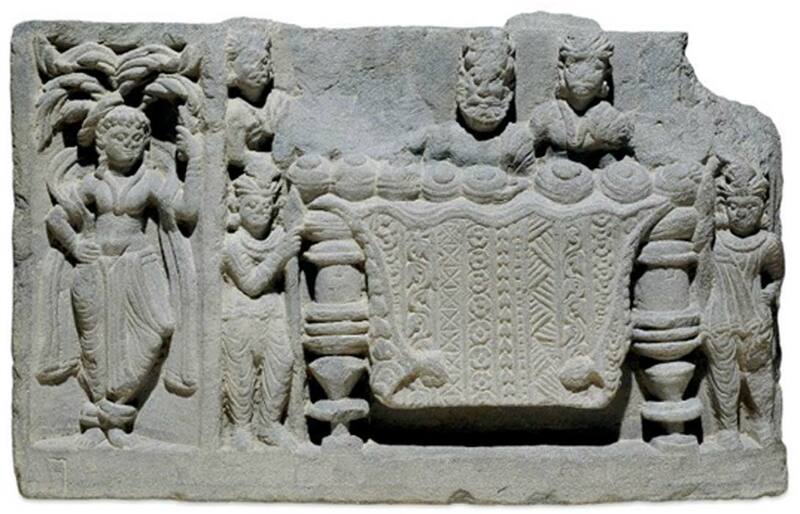 Greco-Buddhist cultural exchange intensified after Alexander the Great’s campaigns in northern India . In 300 BC, two Greek ambassadors, Megasthenes and Deimachus, resided in Pataliputta, which boasted Greek-influenced art and architecture and was the home of the legendary artisan who obtained plans for robots in Roma-visaya. Grand pillars erected by Asoka are inscribed in ancient Greek and name Hellenistic kings, demonstrating Asoka’s relationship with the West. Historians know that Asoka corresponded with Hellenistic rulers, including Ptolemy II Philadelphus in Alexandria, whose spectacular procession in 279 BC famously displayed complex animated statues and automated devices. The article Robots guarded Buddha’s relics in a legend of ancient India ’ by Adrienne Mayor was originally published on The Conversation and has been republished under a Creative Commons license. It is true that there were stories of “robots” in early antiquity, like the tripods and golden maidens described by Homer in the Olympus palace of gods (Iliad book 18, 375, 415-420), Talos the copper giant guardian of Crete, etc. Nevertheless one should distinguish the myths and pure fantasy resulting from the desire to fabricate such artifacts, from real achievements around the 3rd ce. BCE onwards. In that era, Heron, Philo of Byzantium, Ctesibius etc actually constructed mechanized automata, although not really robots per se, as well as complex contraptions such as the Antikythera mechanism. India may have followed a parallel path, especially after Alexander's era. Why does one think these were immaginary? If we were visited and influenced by aliens there would most likely be AI robots. most stories of past were based upon reality. Read more about Could Human Beings become Immortal by 2045?